Monthly Mindfulness meditation class in Darlington town centre, incorporating mindfulness meditation, mindful movement and discussion. In addition, mindfulness has been shown to have a positive effect on our physical health. Research has shown that regular meditation strengthens the immune system and increases connections in the brain. In conclusion, practicing mindfulness improves both mental and physical health. 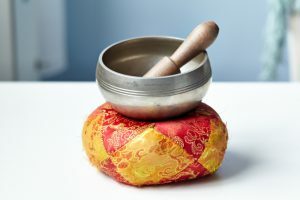 Mindfulness involves both concentration (a form of meditation) and acceptance. Deliberately paying attention to thoughts and sensations with curiosity and without judgment. Our meditation class features a selection of formal and informal meditation practices. These include body scan, breathing and compassion meditations along with mindful movement. Discussion to support personal practice including techniques developed from positive Psychology and simple exercises for informal practice. Positive psychology uses scientific understanding and effective intervention to promote happiness and wellbeing. Suitable for all abilities and levels of experience, beginners always welcome. Donation basis, suggested donation £2-£5 on the third Tuesday of every month evening 5:30pm-7pm.